As government agencies handle increasing volumes of information, it falls to every person within an agency to manage and protect vital records. In addition to traditional paper documents, records can include everything from emails to photos to electronic files. With so much information to manage and so many people handling the information, are federal records at risk? 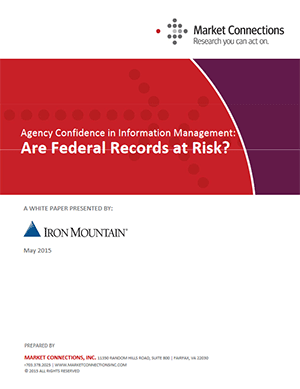 Strong records management policies and practices, coupled with formal training, internal controls and communication, will keep agency records safe and meet federal records management regulations. When agencies take these steps congruently, they can boost confidence in their information management processes, increase productivity and expand access to information, all while complying with federal mandates. Fill out the form below to download the research report and white paper.